Shortly after purchasing PaceMaker plug-in registration, you'll receive your registration codes by email. 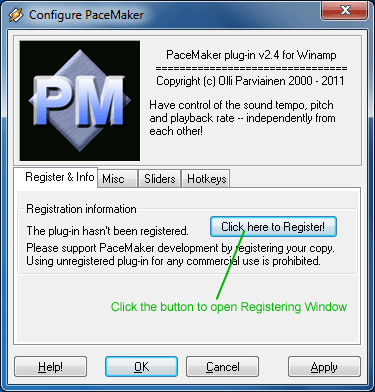 These registration codes are entered in PaceMaker plug-in in order to activate the registration. 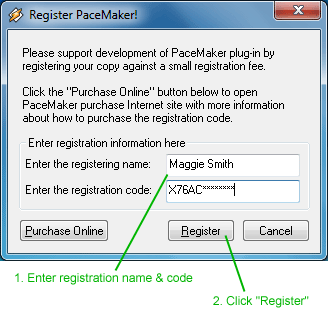 Please follow these instructions for how to enter your registration codes in PaceMaker plug-in. Step 1. Open PaceMaker Registration Window. The PaceMaker Configuration window opens, and push here the "Click here to Register!" button to open the PaceMaker registration window. B. Alternative If you've used PaceMaker plug-in already for few weeks, you may see the following splash window on your display upon opening the Winamp player or PaceMaker plug-in. In such case, click "Register Now!" button to open the PaceMaker Registration window directly. PaceMaker registration window opens, looking as below. Enter your registration name and code in window accordingly, and click "Register" button to comple the registration. Notice that "Register" button is activated only after the whole code has been entered. Please notice that the registration code contains both numbers and letters that in some cases are easy to mix - for example, Number "0" ("zero") and Letter "O" ("oh") look dangerously similar, as do Number "1" and Letters "I" or "l" . If your registration code is not accepted, then please cross-check that you've surely got possible zeros, ones, Is, Os and Ls in the code right. To avoid this trouble altogether, it's suggested to Copy+Paste the registration code directly from your email tool to PaceMaker registration window to avoid manual typing and getting the code right for sure. The registration transactions are verified manually and the codes will be sent to customer usually within 24 hours of purchase. If you still have not received your codes by next day, then it is likely that the codes have been delivered but your email tool may have moved the email to spam/junk mail folder. In such case, please check your email tool junk folder in case that the codes have ended up in there. If you don't find the codes in junk folder either, please send email to <support@surina.net> and we can email the codes to you over again. Firstly, you'll need Winamp media player and PaceMaker plug-in both installed in your computer. If you don't have these, you can download and install both tools for free following the links for Winamp download and PaceMaker download correspondingly. PaceMaker installation tool automatically activates itself in Winamp player settings, so you should see PaceMaker opening automatically when you start Winamp player. It is possible to choose another plug-in or deactivate plug-ins in Winamp settings, and in case you've done that, please see here for instructions how to re-enable PaceMaker plug-in in Winamp.